Correction: The amount appropriated for additional prosecutors, public defenders and support staff for both was $1.56 million, not $750,000 as originally reported. The funding will be split evenly between prosecutors and public defenders, resulting in an increase for both that’s slightly below $800,000. After two days of amendments, the House has passed an operating budget Thursday that cuts about $200 million from state spending compared to the status quo. The final vote was 24 to 15, along caucus lines. It came after the House voted to end the amendment process early, cutting off debate on several majority and minority amendments, including any that dealt with the PFD. The PFD is intended to be dealt with separately from the budget. A vast majority of the amendments proposed by minority Republicans didn’t contain cuts but were instead intent language directing the state to—in many cases—do things it’s already doing. Still, the early cut-off on amendments cause minority Republicans to cry foul over the process. In full debate, they also complained that the House had started with a status quo budget instead of one proposed by Gov. Michael J. Dunleavy. Rep. Chuck Kopp, the Anchorage Republican who chairs the House Rules Committee for the bipartisan majority, swatted away criticism, suggesting that the amendments proposed by minority Republicans were getting into the territory of an intentional delay. As for the Dunleavy budget, Kopp said he supported the governor’s desire to “put government on a diet,” but said it needs to be done responsibly. He questioned whether paying out a $3,000 dividend was responsible. He noted that about $800 million of the governor’s proposal to close the $1.6 billion deficit, which itself was largely driven by the $3,000 PFD, comes from seizing money from local communities whether it be through siphoning away property tax revenue collected on oil and gas properties, fisheries taxes that are shared with communities and by eliminating bond debt reimbursement the state had once promised. Rep. Tammie Wilson, the North Pole Republican who co-chairs the House Finance Committee for the majority coalition, also took issue with the protest of the minority Republican. She noted that in her legislative career, she had authored more than 400 budget cutting amendments. She said she would have liked to cut more, but she echoed a problem that many legislators have had with the administration’s budget. She also noted that budgets only allow for the maximum spend by an administration and the administration can’t be forced into spending much of it, whether it be through financial restraint during the year or through the governor’s line item veto. The House did approve several changes over the last few days, with most adding money back into the budget compared to cuts made in the House. Here’s a quick rundown of the more notable changes. Restoration of 50 percent of the school bond debt reimbursement program, adding $16.5 million from the school fund and $33.4 million in UGF. The elimination of this funding raises concerns about its impact on local property taxes. In the same amendment, the House also restored $19.6 million for Regional Educational Attendance Area and small municipal school district fund. $180,000 in UGF to restore the state dairy inspector, with intent language to transition the program to a fee-based model in the future. A $1 million increase for the Legislature’s budget in preparation for an unknown number of special sessions, as well as $1.6 million for additional audits. A 5 percent cut to the Department of Transportations’ Southcoast region, which was missed in the House Finance Committee reductions to other regions. An increase of $1.56 million split evenly (a little less than $800,000) between additional prosecutors and additional public defenders, along with corresponding support staff for both. The House now hands the budget over to the Senate, which is already underway with public testimony on the measure. The Senate has already been working on the budget, so it will likely get the budget a vote within the next week or two. That will then send the operating budget to a conference committee process to hammer out the differences in the budget. 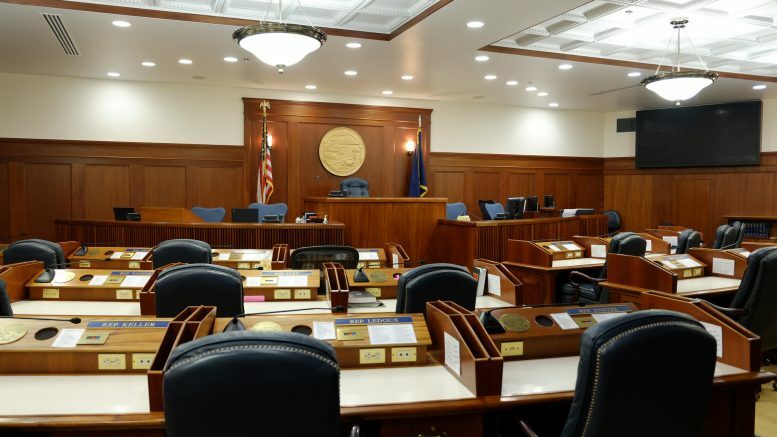 The Senate Finance Committee leadership has suggested they’d be a little more aggressive with cuts and have currently suggested a 50-50 split between the PFD and funding state government for the annual draw from the Alaska Permanent Fund’s earnings reserve account. According to previous presentations, such a split would require about $861 million in cuts or new revenue from elsewhere. The House also failed to pass its constitutional budget reserve vote, a 30-vote threshold in the House. Such votes typically fail on the budget’s first passage so the minority can hold onto leverage over the budget as it moves forward. Be the first to comment on "House ends operating budget amendments after two days, passes budget with $200 million in cuts"